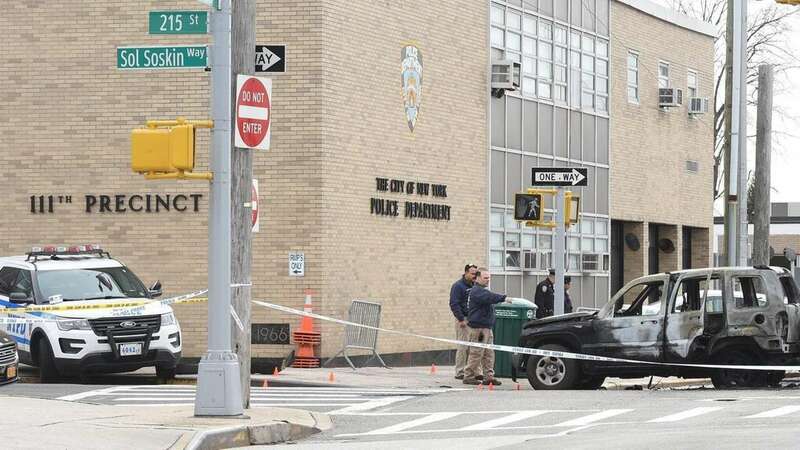 A Queens man crashed into a marked police car parked in front of the 111th Precinct in Bayside before officers shot him, authorities say. NYPD officers shot and wounded a man Sunday after he set his vehicle on fire outside a Queens police precinct before charging at cops with a 12-inch kitchen knife, authorities said. The suspect, later identified as Jarrell Davis, 33, of Queens Village, Queens, was hospitalized in stable condition Sunday after being shot multiple times in his torso and leg outside the 111th Precinct in Bayside, said Chief of Patrol Rodney Harrison, who spoke at a news conference at the precinct hours after the shooting. Davis was arrested early Monday morning, the NYPD said in a news release. He was charged with arson, attempted arson, criminal possession of a weapon and multiple counts each of menacing a police officer and reckless endangerment. No attorney information was available. Harrison said that about 3 p.m. Sunday, Davis crashed his vehicle into a marked police car parked in front of the precinct. Davis then exited his vehicle and sprayed an “accelerant fluid” on the police car. He next sprayed the fluid on his vehicle and set it on fire, Harrison said. Police officers left the precinct and approached Davis, who “brandished a knife and charged at the officers,” Harrison said. EMS transported Davis to NewYork Presbyterian-Queens in Flushing and the two officers went to North Shore University Hospital in Manhasset for evaluation, Harrison said. The kitchen knife brandished by the suspect was recovered at the scene.